This advertising service is free of charge. No fees are required to look at or create an ad. It is reserved to all kind of pre-1970 single-seater racing cars. The F3 Historic web site and the Historic F3 1000cc European Trophy are not involved in any deals that may occur in relation to this service nor can they be held liable for any transaction or be responsible for any misrepresentation. Be kind enough to inform us if your car/parts have been sold, such that we can mention it on the list. Complete set Hewland Mk6 Gear Hubs, great condition and can arrange postage. GB Tecno formula 2 and formula 3 uprights. Cast in LM25 and heat treated to TF condition. Pattern and machining taken from original parts. Chassis No: F3-69-6; originally supplied new to Jolly Club Milan and driven by Giorgio Pianta and Franco Conti during 1969/70. Re-patriated in 2008 and fully restored by Richard Eyre specifically for Monaco 2010 (finished 5th). Subsequently acquired by current owner in 2013 and maintained to the highest standards with no expense spared. Numerous podium finishes including outright wins at Zandvoort (+ HF3 lap record); Silverstone and Donington. Goodwood entries past 4 years. Full documentation with HTP until 2026. Totally correct and immaculate condition and fully race ready with freshly built Richardson engine ( zero miles ) and Hewland Mk6 gearbox with new 7/31 cwp. Aluminium fully adjustable Koni dampers; Lifeline Zero 360 electric fire extinguisher system. Dry and Wet tyres. Some additional spares. Further info and price on application contact Steve Smith. GB Original Vegantune F3 engine from 1971 Ensign LNF3 ex Riki Von Opel car. Disassembled ready for rebuild. Needs new valve guides and bearings and a general refresh. GB MAE downdraft manifold in good condition £380 + postage . Over 800 sold - not a single problem - proof of their quality & durability . IT Selling historic flywheels & ring gears, all in good condition. MAE PARTS. I have a down draft Mae head just pressure tested and is perfect,it has just had New Ivey Gold race springs with new tops and collets fitted, also has New colsibro valve guides fitted , valves are all lapped in , head is ready to fit. March 703 Formula 3. 1970. Delivered 27th March 1970 to Leif Hallgren in same orange colour the car is now painted (minus stripes!). Full restoration by Jon Waggitt in 2010 with all chassis work by Peter Denty. Downdraught 'Holbay' engine by Jeremy Bennett (Nemesis). Has been invited the last three Goodwood Members meetings. HSCC papers. Well known car in immaculate condition and maintained regardless of cost. No crash damage and highly reliable. Very competitive car in right hands (not mine!). Two 2nd places at Snetterton in 2017 by Peter Needham. Lotus type 31 Formula 3. 1964 ex- Jim Russel car. Full restoration by Jon Waggitt in 2012 with all chassis work by Peter Denty. Downdraught 'Cosworth' engine by Jeremy Bennett (Nemesis). Has been invited to all the modern Goodwood Members meetings. HSCC papers. Well known car in immaculate condition and maintained regardless of cost. Never crashed, and is highly reliable. IT Rare AGV vintage jet helmet from early 1960€s, in SWEDEN colors (hand painted) and €Svenska Bilsportforbundet€ sticker. Very nice overall conditions, some normal signs from use and age on the shell, interior looks very good, leather and red satin fabric for construction. The rubber edge has a little crack but it€s repairable (see pictures). GB Rear Cross Mamber for sale. Believed or suspected to be 723, but could be 713,713M 723,733 etc? Side frame fixings @ 467mm centres. Very good condition, possibly new old stock? DK Palliser WD3/2-1 formula 3 car from 1971. This is the ex. Derek Lawrence, 1971 and Jac. Nelleman, 1972 car. It comes woth a Lotus TC and Hewland mk.7 gearbox, and a set and slicks and wets. There is too a set of very wide rear wheels, that Derek Lawrence used for the 1971 ROC on Brand Hatch, I am not sure if those are legal today ! HOLBAY side draft manifold in superb condition,I have vapour blasted it ready to fit, has very nice airflow lines. ALSO AVAILABLE A NEW CENTRAL UPPER BODYWORK AND A SECOND HAND NOSECONE FOR TECNO F2. bearing carrier, arm and slave cylinder. New output flanges, input shaft and bearings. Crankshaft short stroke. Cylinder head with big valves. Titanium connecting rods F1 New. Piston new 2 bands. Cam carrier everything new. Bosch / Kugelfischer injection pump with pumping 8.5 mm. Intake throttle body assy 48 mm (1 304 007 / 10304008). Trumpets F1 Magnesium (V1 105,139). Oversized oil pump. Water Pump and diverter aluminum new. New injector pipes. New aviation oil pipes with aluminum fittings. Complete with pick-up and Sachs twin-plate clutch in copper. 314bhp @ 9000 183 lbs torque. Four renovated historical Lockheed 1.3/4" caliper of aluminum. The calipers have new cylinders and seals. HOLBAY Oil Pump in good condition. Very Reliable car on the button with a strong engine recently rebuilt personally by Andrew Tart at ATME...Gearbox in in 100% condition. GB Hewland MK5 gearbox with LSD, Brabham side plates and 8/33 final drive. Stripped for inspection. Has MK7 (six speed) rear cover and spacer). Some new gears. £5000.00. Also available new 8/35 crownwheel and pionion with new pinion bearing £500.00. MATOCEAN Covered trailer. 1300KG Gross. Load bed 4.50m X 1.85m. Hydraulic tilt bed. Winsh. Tyres rack. 2 removable storages 2.50m X 0.60m. LED lights. New tyres. IDEAL SINGLE SEATER. 2800 EURO. Perfect, ready to be used. Purchased by previous owner more than 30 years ago directly from De Sanctis, always kept in a garage , absolutely original conditions. Purchased by me from 2009, it has undergone a total and careful restoration in order to take part in the 7° Grand Prix Historique de Monaco in 2010. After this event it hasn't raced any longer and it's in excellent conditions. Complete restoration of all the mechanics, the bodywork, the interiors and tuning of the car, under the performance profile, was performed at the highest possible standard . More pictures on demand . 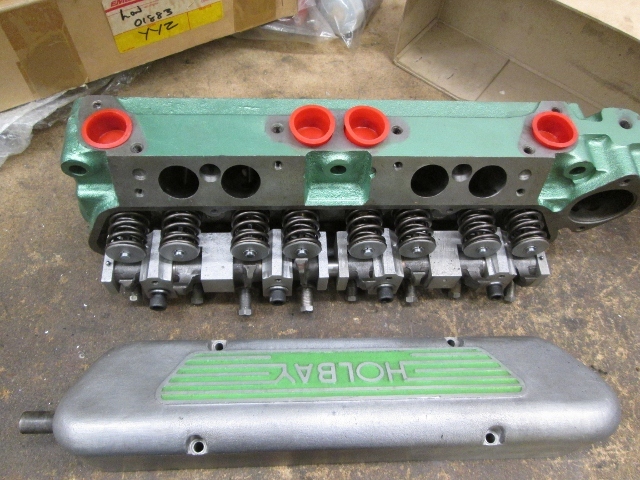 DE Holbay downdraught cylinder head, the head is used, there is a damage at one valve seat. 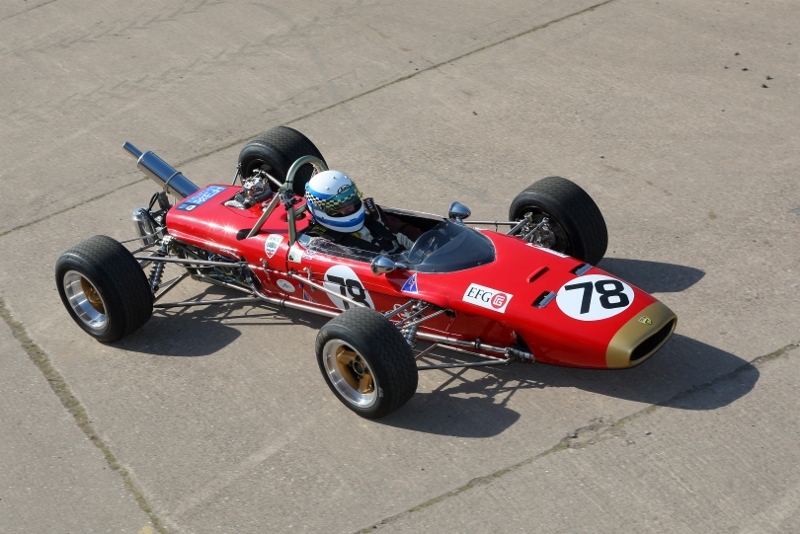 IT BRABHAM BT28-22, very excellent and clear history, very competitive car, totally refurbished, bodywork and all the details perfect as per proper configuration of the period. Peter Denty restoration, engine built by Greg Margetts (CES). Brabham and Cosworth are two of the most iconic names in motorsport. When paired together as they are here in The King's Garage collection Brabham BT-21B Cosworth, magic can and will happen. The car on offer from The King's Garage collection is a Brabham BT-21B Cosworth, chassis number AM283 and was purchased by Brabham's Formula One engine builder extraordinaire Bob Ilich. The car presents immaculately with vast sums spent on its physical and mechanical restoration to bring it to the zenith of BT21 and indeed Brabham racing car desirability. Having been shown at the 2012 Motorclassica Concours d'Elegance and bearing the signatures of Jack Brabham, Ron Tauranac and ex-Brabham race driver Tim Schenken, AM283 is a one of one Brabham-Cosworth with an unmatched history and pedigree that is ready for its natural habitat of the race track or for showing at major events worldwide. Usable and iconic is not often a phrase reserved for old racing cars but in the case of this Brabham BT21B being offered from The King's Garage collection. This Brabham BT21B features a highly developed Ford-Cosworth MAE engine displacing 998cc and is designed to run to 10,000rpm. The engine is mated to a Hewland transmission and is as period correct as it could be with the added benefit of not having been run in competition since the entire car was restored. Fresh from a nut and bolt rebuild/restoration this Brabham F3 is in better than new condition benefiting from a meticulous approach and the refinement of 50 years of engineering evolution guiding the process. This F3 is eligible for historic racing events worldwide and represents an unparalleled opportunity to tour the world driving in classic events such as Formula Junior or simply to have an immaculate Brabham to display at major shows worldwide. Resplendent in its 1950 Indianapolis 500 livery, the #27 Sampson CC-50 represents the golden age of Indy front-engine competition at a time when the legendary Offenhauser engine dominated North American motorsport. This magnificent piece of racing history was built for Sampson€s return to the track after a decade away from racing coinciding with WWII. Built on a chassis supplied by pit mechanic Johnny Rae, the Sampson was fitted with an experimental supercharged 177ci (2.9-litre) Offenhauser inline four-cylinder engine built by Meyer and Drake. Famed race car designer Lujie Lesovsky crafted the all-aluminium body over the bespoke chassis with the car finished off with 18x6.5-inch Halibrand magnesium wheels. GB Brian james clubman trailer for sale in excellent overall condition wheels and tires as new, with locking wheel nuts. Spare as new with separate lock, new winch with handle, new tow hitch and brake cables brakes recently serviced, all lights working with no damage, fold down mudguard on drivers side. A very well maintained trailer. GB PRG race hauler covered 4 wheel trailer, twin axle, tilt bed, new cover a couple of years ago so no rips or damage, has 4 x 12" miniature alloy wheels with good tires all round, tows superb! Brakes serviced and all lights undamaged and working. Measures 71" at the rear by 142" bed length. several brand name trailers suitable for motorsport usually in stock, please call with your requirements. FR Tecno Wishbones or full set for: F3/F2, Formula Ford, and Formula France. Pre-orders on commission before batch of re-fabrication. Tecno owner are scares as spares are. New strong wishbone are a must specially if you intent to race one of these car. We will remanufacture these wishbone in T45 super strong lightweight aerospace steel. Full set at 2500 € plus Vat. Price is very reasonable considering the amount of work involved and material cost. Please email (Laurentdutoya@gmail.com) or call for more information and to reserve. Pre-order close March 2017 Expect delivery May /June 2017. 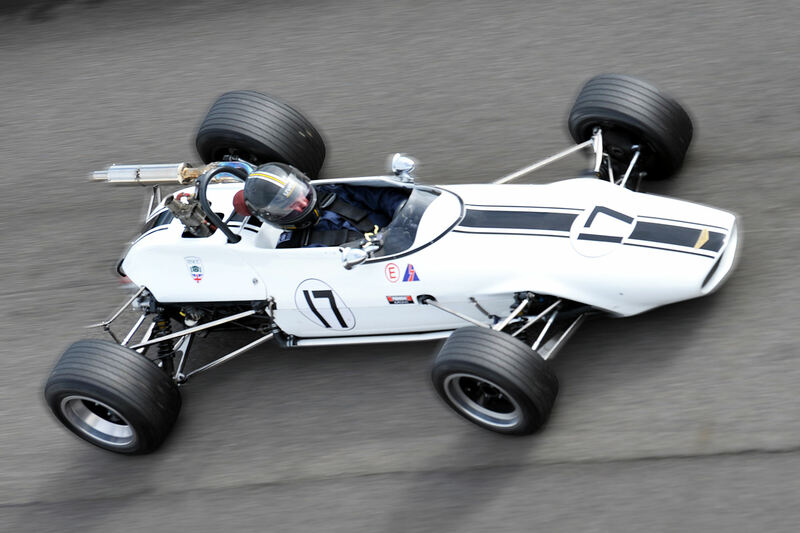 Steve Wilkinson's immaculate Brabham BT21B, winner of The Historic Formula 3 European Trophy in 2007, is offered for sale with re-built engine, spare wheels, bodywork with new screen, extensive sets of gear ratios; as well as external water and oil heaters. Originally Driven by Harald Etrl for Team Eifelland in 1970. Since restored by Simon Hadfield and regularly used in the HSCC Historic Formula Three and Classic Racing Car championship. Now for sale after many years of ownership due to change of plans. Engine just rebuilt, running but not tested. 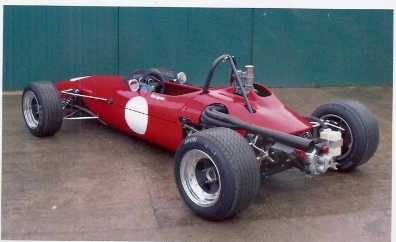 1970 McNamara formula 3 car. Fully restored, comming with a vegantune Lotus F3 engine. Car was shown on the Jochen Rindt Motor Show 1970, now Technoclassica Essen. Including original rims (very rare) and all f3 options. Engine just rebuilt, new paint, many new parts (p.e. exhaust), Hewland MK8 10:31 incl some extra transmissions. Picture from the Jochen Rindt Show, now exept the wings. More pics will follow. DE Parts for sale . Oil pump / cover Novamotor , oil pump / cover Holbay , oil pump HSC 101 , Weber plate , MAE cylinder head down draught , rocker 's , Lucas rocker cover , Holbay rocker cover , Smiths Rev 12000 instrument , Koni alu , dry sump alu / steel , Hewland adapter plate , Lotus adapter plate . More info's ,pic's , prices please mail . Dean Forwards Championship and race winning Brabham. New FIA Papers, Very good condition including many new parts. One meeting since engine freshen, PDS Gearbox. Very competitive and easy to drive. Please ring Dean Forward Motorsport +44(0) 1266 388171 for full details. First delivered to Jean Blanc (Swiss) in 1966. He returned the car that season to upgrade the suspension to the later 41C specification. Jean campaigned the car throughout 1967 and 68 including entries at Monaco, Monza, Pau, Hockenheim, Jarma, Many Cours and others. Period results include 3rd place in Germany (Eifelrennan), 14th in Spain (Jarma) 14th at Many Cours (one place ahead of Francois Cevert) and 17th at Monza. The car was invited and raced at the 2010 Monaco Historic. Full and extensive restoration by Simon Hadfield in 2014 including engine by Stuart Rolt and gearbox by Tony Wilson. Original wheels together with a specially commissioned set of correct 6 stud rims. Full photo record and receipts available. The car has only raced once since the rebuild at the 2015 Members meeting. The car is sold with a 2016 Goodwood Members meeting invitation that will be transferred with the ownership. Genuine period F3 MAE inlet manifold. 3 races only since total rebuild including Stuart Rolt engine, many new parts including new bodywork and engine cover. Roll hoop extended to current FIA spec. Extra two piece bodywork included featuring removable nose cone and extra shoulder room. 1000 MAE + lotus twin cam. BE I have a rare Hewland HD5 gearbox for sale. 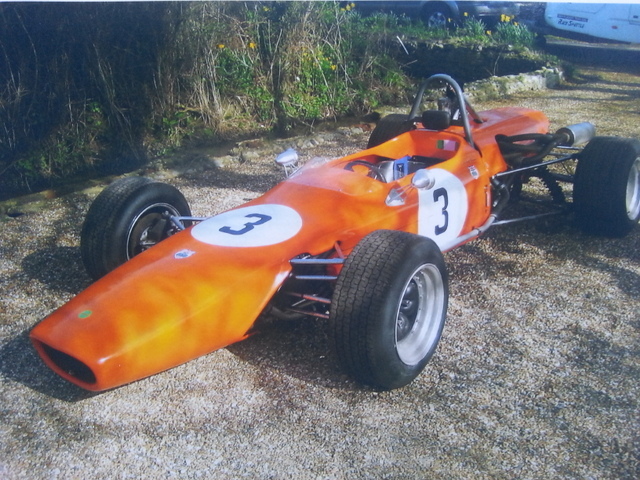 It was fitted to a 1970 Formula 3 chassis with Rover V8 engine and is surplus to requirements. The car was retired from racing in the late seventies and kept in a private collection. I have not stripped the box, so its condition is unknown. The case looks fine and has some trace of repair in one place. details of the suspension; 3 tires; 2 rims 13X5.5 Cromodora Abarth CD30 (one good, one to be restored);2 rims Cromodora Dino 14x6,5 (the originals); 1 circle 14x6,5 decomposable (as rear mounting machine ); Many parts Lancia and Fiat new and Used. and in France in the years 1968-69-70. It has won four Italian championships from 1968 to 1971, 2 Championships in France and 2 times the G.P. F3 of Monaco in 1968 with Jean Pierre and Jassaud in 1969 with Ronnie Peterson. so manic by a famous Italian specialist. getting good results and always finishing in the top. In 1971 the 'car was purchased from Scuderia Mirabella Mille Miglia in Brescia. The FIA in the year 1971 has changed the regulation, increasing cylinder capacity engine 1000 cc. to 1600 cc. It continued to race with other drivers including Renzo Zorzi in 1972. Carrosserie d'origine, radiateur, bache à huile et transmissions en sortie Bibax. Jantes d'origine Tecno, restauration ancienne à reprendre. Brabham BT21B 1000cc F3. Chassis No 1. Documented History. Current FIA Papers. One of the best and fastest Brabham with many outright wins in UK and Europe. - Designed by the Pederzani brothers - bodywork by Medardo Fantuzzi. FEV fire system; all new wiring; cables; oil pipes; plumbing; joints; tyres; discs; rollbar; belts; fuel tank; oil cooler. The car is simply stunning and its incredible rarity makes it a hugely desirable car. With the car will come a wealth of spares - block; gearbox case; ratios for all circuits; all body moulds; 4 spare wheels with wets; spare plated wishbones; suspension jigs and all the original bodywork, and as many of the original parts as you want! This is a very reluctant sale and I am looking for someone to take this car on to achieve its potential in Historic F3 and other series. Chassis 00204 was built in mid/late 1966 and was initially driven by the works driver, Carlo Facetti. The car first appeared at Mugello in July, finishing fourth and at Monza with Pino Babbini, Giancarlo Baghetti and Facetti - who clinched third in September 1966. Three cars, including 00204 were then taken to Argentina in 1967 for the Temporada series. The works drivers included Facetti and Alfredo Simoni, to be joined later in the series by Clay Regazzoni and then by Boley Pittard. As far as we know, the car last ran in 1967 and was mothballed, coming to the UK in 2003 and largely left unrestored - including the chopped off nose from Argentina! HOLBAY WEBER IDA SLIDE THROTTLE CARB. Proper period slide throttle ready to fit. for extra top end power as shown in photo. IT For sale De Sanctis F3, built (probably) in 1966. The car is original, restored 20 years ago and never used since then. The car is complete with all its original equipment, original wheels, instruments, shock absorbers, wheels, steering wheel, engine and gearbox. The one and only Chevron B15c ever made. In beautiful condition and with many wins. This is the car to have as it is unique and be a favourite at the special invitation races. Recently rebuilt engine and gearbox, totally rebuilt last year. Featured in the film "Rush"
Nova Motor Weber IDA 46 on eBay. Ex Jonas Qvarnstrom , 10 th Monaco 1968, binder with full history, well known car. Restored 2013/14 to original Monaco spec, eveything is new, rebuild and period correct. Concours conditiion throughout. Fresh correct engine with all the right bits, 0 hours since Connaught rebuild, only 3 installation laps at Spa, race ready. 1 Brand New MAE front main cap never installed, complete with crank gear, idler gear, and cam gear. 1 Used Holbay rocker cover. Wheels in very good condition ! Lotus 23 parts wanted !! Ex chequered flag team car, driver Chris Irwin, wins at Monaco & Goodwood 1966. Peter Denty restoration, everything low miles.in side draught spec.included with sale.downdraught head,carb & manifold. MERLYN MK14A VERY SUCCESSFUL CAR RACED IN PERIOD BY PATRICK CHAMPION, IT RACED AT MONACO IN 1969 HAS FINNISH EVERY RACE IT HAS ENTERED FOR THE LAST 4 YEARS RARELY BEATEN, HOLD MANY LAP RECORDS. CHAMPIONSHIP WINNER IN UK AND EUROPE. Tecno F3. Dean Forwards Championship and race wining F3 For sale. Complete rebuild for 2014. Please contact for full list. Double winner at Croft 2014. 1968 Brabham BT21C -1600Ford Twin Cam180ch Hewland FT200 autobloquant, 1 set roues suplémentaires.Très belle voiture avec historique connu. Sales with two set of wheels. The history for this car is well documented back to 1972. When it was purchased from Glenn Hyatt of Low Cost Racing in the UK, I have a copy of the for sale ad, when purchased by Dave Wachtel. I have a copy of the letter between Wachtel and Hyatt discussing the details. Wachtel raced this car for many years, but lost the chassis tag while the Brabham was travelling on an open trailer back from Lime Rock. Chassis number is being researched, but is unknown at this time. Car currently with TwinCam installed. To be sold as F3 configuration, with no engine, 8:31 ring and pinion, open diff., 4 speed and 8" and 10" wheels. Perfect for Historic F3. Car has been fully restored, all new fiberglass, new fuel cell, new belts, new radiator, new oil tank, new donuts, chassis repairs and refinished. $70K US without engine, $80K US w/ TwinCam. Please email any questions or for more pictures. Sold without engine and gearbox. Very original car. Ran in period as a front running car with noted competition history. Complete with an original SCA Cosworth engine, Hewland Mk7 six speed gearbox and all original components. plus miscellaneous spares including valve parts, windscreen (clear), etc. The car runs perfectly and starts on the button. Has a very good history and will be very eligible for the most prestigious historic events and series. US 1966 Brabham BT-15, chassis # F3-33-66. Full history from new. This was the last BT-15 Chassis built in 1966 and was supplied to Mike Knight, to re-chassis the Ex Peter Gethin car by the factory in 1966. It was entered by Robs Lamplough and driven to Championship points by Knight in late '66. The fully restored as new chassis is now fitted with a fresh Full Race ARJAY Lotus 1600 Twincam with dyno sheet of 180hp. A rebuilt and fresh Hewland Mk 8 open diff. 4spd is supplied. Will split engine and sell with/without. Brakes to new owners specs. FB or F3. and all parts are rebuilt or replaced to new condition, with alloy wheels and a set of Magnesium Wobbly web Brabham wheels also available. A new spare body is also supplied. Car is in Connecticut USA, shipping available worldwide. $50,000 USD with engine and Hewland incl. The car is simply in immaculate condition. The car has been restored for 13 years by its current owner regardless of cost and with unique respect for every little detail as well as the originality of the car. Complete rebuild engine using the original Cosworth 105E block; Pistons; Conrods and Crankshaft. New Richardsson cylinder head. Original Hewland Mk. 6 gearbox (fully restored). Original Armstrong dampers (fully rebuild by specialists in the UK). Only done one shake down since complete rebuild. Comes with 2 sets of wheels (1 set brand new). The car is only for sale due to the sudden death of the owner (Jorgen Egdal). Unique chance to acquire one of the most beautiful and authentic Tecnos. MAE 1000cc Ford Richarson engine revised with only 30 km of use (Vernasca Silver Flag). (Which also confirms the official list published in 2009 the book "In the mind's eye" written by Kevin Hodgkinson, this car 'was driven in 1968 in a F3 race by Peter Gethin in the English league. And then it was sold to another legend of motoring, Frank Wlliams, who at that time was at the beginning of his racing career and was racing car F3 with his small team. Peter Gethin 'then moved to compete in F1, and in 1971 with a BRM won the GP Monza, winning two records never again 'beats in the history of F1: the speed 'average race more' high (242 km / h) and the gap on second placed more low (Ronnie Petterson) to 0.01 sec. !, third (Francois Cevert of Tyrrel) to 0.09 sec. Mike Hailwood quarter of Surtees in 0.18 sec. Fifth Ganley of BRM in 0.61 sec. It 'was the arrival of more' spectacular, with 5 cars in the sprint at the finish line of the races of F1. This car was imported to Italy in 1991 from England and it belonged to date the same owner. The restoration 'was made at the highest level, and is even more beautiful in reality than in pictures. It is sold with 4 spare wheels and the Hewland gear box with the spare included in the price. - FISCHE F.I.A. (FICHE D 'IDENTITE' POUR VOITURE ANCENNE) 1995. - REGISTERED TO TECNO REGISTER . Italy and Europe in the years 1968/69/70. Jean Pierre Jaussaud and in 1969 with Ronnie Peterson. Giovanni SALVATI was the name of this young pilot who made the first race of the pool, the tour more 'fast in the race and clapper until three laps to go with the already said Ronnie Peterson sending into raptures the public of Monza. In 1970,with another Tecno Salvati won the Italian Championship of F3. In 1971, unfortunately, in an F2 race at Taruma in Brazil, came out 'track and died just when his talents were noticed by major F1 Team. How can see from the photos the conditions are really fantastic. GB 13' x 11" magnesium 3 piece wheel. 6 spoke magnesium centre has been professionally crack checked and powder-coated in satin black. Centre lock outside i/d 40mm and 6 drive peg holes at 45mm centres. Only one wheel. BE For sale Brabham F3 1600 cm3 new wheels. With new rain tyres. Front 8" x 13". Rear 10" x 13". BE For sale Brabham F3 1000 cm3 rear wheels 11" x 13". Mag genuine. Dispo en France en 90. FOR SALE: 1000cc F3 CHEVRON B17 #F3-70-6 Ex- Rolf Reisen. This Chevron is located in Switzerland since it was sold new in 1970 to Rolf Reisen. Complete history and documents come with car. Mint condition. New Richardson engine (2 hours). FIA HTP. Ready to race 2014. 75 000 CHF. vends quatre demi trains tecno F3 . Previously advertised 2010 (see ad. 123) has undergone an extensive renovation, e.g. all suspension parts,not uprights,from Peter Denty, brakes and body. good condition FFSA papers . May consider selling Engine and Gearbox seperately. In 1971, the A360 have been fitted with a modified body for the Castellet (July 7th). They have been named: Dinosaur, due to the fact of the rear bonnet and a front spoiler to protect the tires and get fresh air to the brakes. It is in 1972 that the A364 has appeared. Fitted with an injection the Dudots engine has permitted top drivers like: Depailler, Jabouille, Serpaggi, Leclere and Guitteny to win races. 1967: Patrick Depailler becomes a team member of Alpine F3. Coupes de Paris at Montlhery: Depailler and Bianchi driving the A330 F3 have difficulties versus the competition. Last chassis of this model made and raced in the UK in late 1965 before heading to USA (where some history lost) and converted to Formula C (twin carb) regs of the time. Imported into New Zealand in 2009, converted back to single carb and F3 spec in 2012. Recently had new CWP installed, and new 1st gear fitted. Car is very tidy, and indeed, race ready. New fuel tanks fitted in 2012. New FIA 2017 belts fitted. A few spares, including twin-carbs/manifold, front bodywork. Always a stunner out on track. Well known car amongst the FJnr ranks that visit NZ for the Festival of Motor Racing. Purchased in 1969 directly from the Tecno factory by Maurizio Montagnani as per original Certificate of Origin no. 116, the car was raced in the Italian Formula 3 Championship during the 1969 and 1970 seasons with the 1.000cc engine. In 1971, the Brescia based Scuderia Mirabella bought the car and updated it to new rules with a 1.600cc engine for the following three years, racing with drivers like Massimo Baliva, Alessandro Guidetti and Renzo Zorzi. Today the car comes with a 1.600cc Ford Novamotor twin cam engine freschly rebuilt by Milan expert preparer Mario Villa. The car has been totally restored and has very little mileage. The car comes with full HTP papers, Tecno Certificate of Origin and Racing files. The superb big trailer will take two small cars or one and plenty of other stuff! FEV fire system; all new wiring; cables; oil pipes; plumbing; joints; tyres; discs; rollbar; belts; fuel tank; oil cooler; you get the picture. The car has only run during twice during 2012 (3 hours on the engine) and is now sorted although will benefit from more work on set up. With the car will come a wealth of spares block; gearbox case; ratios for most circuits; all body moulds; 4 spare wheels; spare plated wishbones; suspension jigs and all the original bodywork, and as many of the original parts as you want! This is a very reluctant sale and I am looking for someone to take this car on to achieve its potential in Historic F3 and other series maybe even Monaco 2014? Tel : 0033 632 54 21 88 or 0033 660 98 29 91 (English and French spoken). chassis roulant, sans boite de vitesse, restaurer, dans son etat. BRABHAM BT15/18 F3 Screamer Total Restauriert. IT FOR SALE:Complete new piston set (Pistal Racing) for Formula Junior. IT FOR SALE: New camshaft steel for F3 1000cc or Formula Junior. Dean Forward Motorsport is pleased to offer a race support program running with their own in 2013. Pre & Post race preparation, transportation, storage, and race day assistance is available. Limited places. Valid HTP, known history, raced at Monaco historic GP, Pau historic GP and European F3 historic Championship. Ready to race, Tuned and maintained by Accel Moteur (Bruno Rouill). 1000cc MAE Ford engine, 5 hours running. Hewland gearbox rebuilt two races ago with new crown and pinion. Sale includes complete bodywork (3 parts) new in primer, 4 spare wheels fitted with rain tires, 10 gear ratios and a set of new suspension wishbones. PTH, historique limpide, participations aux GP historique de Monaco, GP historique de Pau et European F3 Historic Championship. Prte courir, prparation Accel Moteur (Bruno Rouill), moteur Ford MAE 1000 cm3 5 h depuis rvision, boite Hewland 2 courses depuis rvision avec couple conique neuf. Vendue avec une carrosserie complte supplmentaire (3 lments) neuve et non peinte, 4 jantes supplmentaires montes en pneus pluie, 10 rapports de boite et un jeu de triangles de suspension neuf. Well known Chevron B17, very successful car over the years in Classic Racing Car series and Euro F3 Trophy. Overall winner of Class D/Formula 3 four times and many class awards driven by David Pullen. Significant rebuild spring 2009 with Stuart Rolt Holbay R70 MAE engine and Cavan Riley (RTS) MK8 Hewland 4 speed gearbox. Since rebuild only used for Brands Hatch Superprix Formula 3 parade lap in July 2009 and the 2010 F3 group test at Brands Hatch, driven by Alexander Sims and featured in Autosport February 2011. Recent updating 2009: new bodywork including engine cover, new revolution wheels and front and rear tyres with approximately 20 miles running, fresh engine (Stuart Rolt) with similar low hours running - no competition running, rebuilt MK8 Hewland (Cavan Riley) with similar low hours running, AVO dampers plus spare original Armstrong with the car, new oil breather fabricated pipes, increased roll hoop height and new roll hoop stay, exhaust stay, breather tank (all by Kerry Adams), new vinyl seat cover to correct pattern, original bag tank serviced around 2007. PLEASE TAKE A LOOK AT VARIOUS WEBSITES REGARDING THIS CAR. THE QUALITY OF WORK CAN ONLY BE DESCRIBED AS THE FINEST!!! Complete race ready F3 1000cc. Very original car with original engine/gearbox. Lucas engine in good condition. Only raced in 1968 and 69 then stored. Two sets of wheels. Raced 2-3 race weekend a year for 3 years since restored. THE CAR IS COMPLETE OF DOCUMENTS FROM BUILDER ( FAGIOLI AUTOMOBILI OSIMO ) , OMOLOGATIONS OF PIRELLY FUEL TANK ETC.ETC. RECENTLY RETURNED TO THE UK FROM THE USA. COMPLETE CAR READY TO RACE. SINCE THIS PHOTOGRAPH WAS TAKEN THE CAR HAS BEEN FITTED WITH FIRE EXTINGUISHER AND APPROPRIATE SILENCER TO COMPLY WITH MSA REGULATIONS. Very original car with Novamotor downdraught engine. Restored in 2000,only 5 races since. New clutch, new radiator, new ignition, new fire protection system and new paint. Located in Denmark,can deliver. DE I like to change a complete very good all steel Lotus Twincam Vegantune formula 3 engine including restrictor, carebuttor, oilpump drysump pan into a 1000er screamer engine. Is there anyone who could offer me anything?? original Mark 6 Hewland 4 speed gearbox suitable for Formula Junior car or scremer formula III car.New 8/35 crownwheel pignion.Original ww internals hubs.Everything in excellent condition. BRABHAM BT21A AM221 1968. TOTAL RESTORATION. Raced only three times, sufficient to prove it can be a race winner. 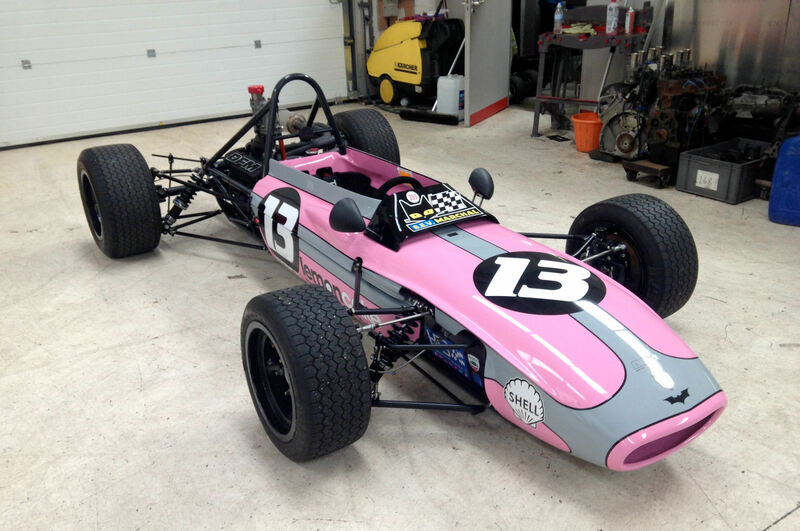 Has a very special 195+BHP Racing Fabrications Lotus 1600cc Twin Cam fitted. Car has a history as both a Libre/Formula B and as a 1 Litre F3. F3 engine mounts included. DE MARCH 733 chassis no. 004, well known history, ex Richard Robarts, 1973 1st in British Lombard Championship. Restored by Peter Denty in the 90s. Running in HRA German Open since middle of 90s. Very good technical and optical condition, race ready for 2011. Engine and gearbox got checked and revised last winter. Necessary parts were replaced and valves were newly fitted with English specialist firm. In 2010 the car was only used for two track days. Car is on BBS rims with slicks and comes with original March Mag Wheels with wets and a second nose. FIA Pass available. However, new HTP required in Germany as of 2011. Driven by Francisci 1970, Gallo 1971, Piazza and Gallo 1972. FR For sale Hewland parts. Two completes original magnesium Brabham side plate with bearings and drive shaft. And original Ford Corsair free differential. Price for this complete lot 1200 €. Two original spyder FT 200. Lot 600 €. 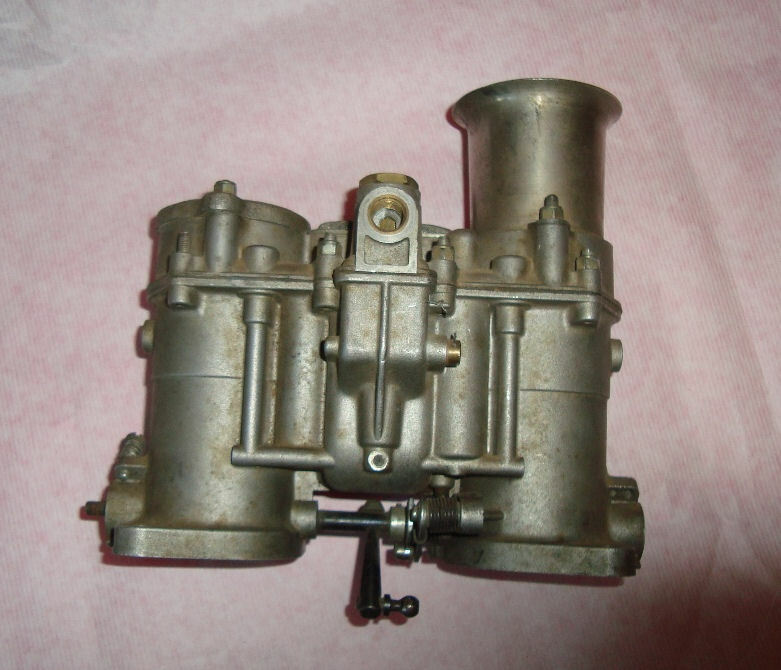 Complete original Cosworth MAE inlet manifold 1965 period with original Weber carbs. Lot 800 €. Ex. Charles Lucas F-3 Titan works car. Total of 18 made. This car is number 2 with chassis # 68302 manufactured 1968. Driven by Mr. Lucas and various top rated drivers during the period. Moteur en état de marche en très bon état sans usure apparente au niveau des cylindres, paliers, bielle, pistons Très peu utilisé après révision complète et mis de côté par précédent propriétaire. Démonté récemment pour en vérifier l état complet et les côtes et permettre à l acheteur d en faire de même. Peinture bloc et culasse à refaire, nécessite joints et coussinets neufs et remontage soigné. Situé midi de la France, proche de Monaco. Crankshaft : steel on 3 steel square caps 6 bolts and double dowels crank bearing diametre : 53,70 mm conrod big end diametre : 48,67mm gears driven. Working engine in a very good condition throughout. No trace of wear on cylindres, bearings, conrods, pistons Very little used after a complete overhaul and put on shelf by previous owner. Recently dismantled before this add in order to check internal condition and allow buyer to do the same. Needs a new paint (block and head), new gaskets, bearings and a careful reassembling. Located in south of France, near Monaco. No shipping. pipe adm verticale, carbu WEBER monocorps TBE + BV HEWLAND type MK8/9 TBE, embrayage cuivre, pipes d'chappement, jantes, pochettes de joints neuves, diverses pices. visible en France 90.Dossier sur demande par tlphone 06 80 94 43 16. Pas de vente en pices. FR Dcoration murale nez Matra MS5. Plusieurs thmes dco possible. PT various brabham parts for sale,including exhaust. Bt21 new front aluminium hubs,will fit early brabhams also. complete down type exhaust system for bt21 with straight through pipe,500e. 2 pairs new donuts,75e per pair. 2 drive shafts,bt21 and bt35. 80e each. 1 pair MRD engine mounts for lay down motor.150e the pair. 4 pairs original bilstien shockers 125 per pair. 1 pair koni aluminium fronts 250e per pair. New Brabham steering wheel and nose badges please enquire. Chassis no 70/1. The unique B17 prototype. Originally competed in Europe including Monaco by John Ralf (American). Fresh Stuart Rolt Engine Gearbox by JP. Racing in the UK. Previous winner of Hanson Trophy. Set of extra Chevron wheels with wets included. Featured in Kevin Hodges Chevron book. Valid FIA HTP.Car is imaculate and on the button. For Sale: TECNO F3 1000cc 1969. #T000326 ex- Lionel Noghs. Mint Condition. Fresh engine by Competition Engines Services.Comes with FIA HTP + 8 wheels. Covered trailer also for sale(extra charge). 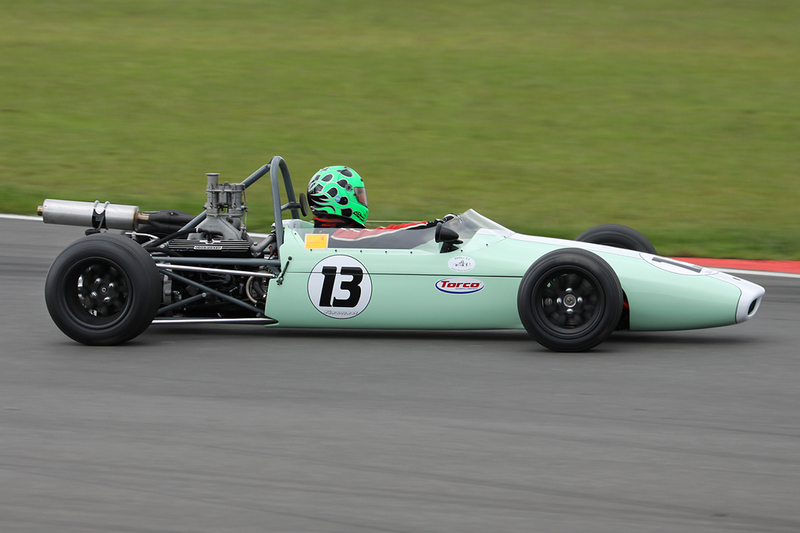 My Tecno 1969 F3 race ready car now with new radiator following recent Brands Superprix. 1 race since comprehensive engine re-build(David Gathercole), new wheels/tyres + originals. New belts, extinguisher etc. Body mould available, new donuts, drive shaft, master cylinders etc. 25,000 MORE DETAILED PICS ON REQUEST. This car is in outstanding condition and ready to race. It is fitted with a Holbay R70 engine and Hewland Mark 8 gearbox. Both have been the subject of recent professional rebuilds. FIA HTP and HSCC VIF papers together with documented history from new. Winner of both the Classic Racing Car Championship and the Peter Hanson Trophy in previous years. Also featured in Bernard Cowdrays book F3 The Screamer Era. IT Dagrada Lancia F Junior 1100 con motore anteriore Lancia Appia originale. IT Formula Junior Wainer, motore Fiat 1100 anno 1959, carrozzeria in alluminio, htp. FR Vend couple conique Hewland MK9 7/31, parfait pour moteur 1000 cm3. Price 500 or best offer. Recent engine rebuild and body respray. 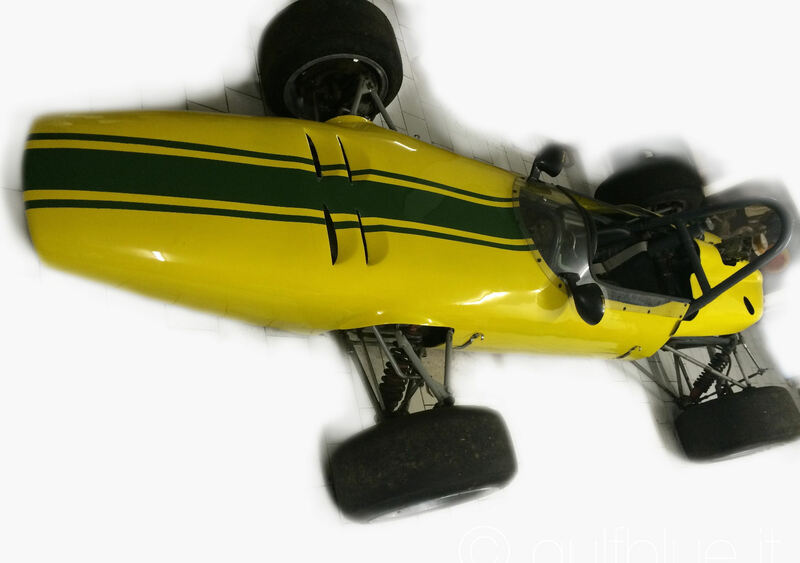 NL Brabham BT 18 F2/3 rolling chassis No.AM186.The chassis is in verry good condition. Complete suspension and steering, Good chroom-except for one front whisbone. Most of the unibolts and shocks are new. No damage or rust, paint is cracket, chassis is not in use for the last 25 years. Including dry sump tank, seat , cooler and instruments, wrong type of brakes. 1965 Lotus 35 F2 with good gearbox. No engine. Very good restauration project 80% of parts. Ready to fit complet suspension, whisbones, stering, pedals etc... New chrome plated. The four upright complet whit new rodend disc and original caliper ok. Original four wheels restaured. New water radiator etc... Photos of complet parts and monocoque avalaibe by mail. Price in Euros 28000. Or interested part exange. engine with Kugelfischer injection and Hewland MK 8 gearbox, with FIA-Papers ready for race. TECNO Novamotor 1970. ex G.Sum. Mint condition. FIA papers. New Engine/Tank/Extinguisher/Tyres/Harness + some parts.Located north Italy, near swiss borders. 35000€. Formula 3 MAE downdraught head. 1000 ccm Cosworth downdraft screamer, restored, engine completely overhauld with new Mahle/Wahl pistons, new Cosworth liners, standart diameter steel crank, rebuild oilpump, all new bearings, all tuftrided etc. Gearbox: Hewland MK 8, Diff. 7/31, front and rear wings, last driven in Spa May '99 by Palle Ringstrm, FIA-papers. Holbay dry sump Mae engine. One of the most original and well known F3 on the international historic racing scene. 2006 European Historic F3 1000cc Trophy leader, 3rd in 2005. Details on www.f3historic.com. The original F3 car of one of the most charismatic french driver ever, tragically killed in the F1 practice at Watkins Glen, in october 1973. Franois won the French F3 Championship with this car in 1968. Chassis # 264; Ford Cosworth (Novamotor) engine totally revised at Borgetto. Car entirely reconditionated, perfect condition, ready to run any historic event or race ! Last run in historic race in 2002. Located in France at Rambouillet, near Paris. GB Jomo Historic F3- Built and raced in F3 1968, used for hillclimbing in the early 70's by Dave Bassett, fully rebuilt in the early 90's. Ford 1000cc screamer by Mass Racing Engines, Jack Knight gearbox. Excellent original condition in British racing green. Just waiting to come back to the track. GB 2 sets of Techno Magnesia 13" diameter race wheels can be used either as centre lock or 4 bolt 4" PCD. Fronts 8", Rears 10" or maybe a fraction of an inch wider. Suit most F3. Very good condition. Come with centre lock carriers. 1,250 the lot, 700 a set. DE MAC NAMARA FF/F3 "Poject"
Historic F3 Brabham BT28, 1000cc Cosworth Screamer MK8/9 Hewland. Concours condition complete with FIA papers and complete history. Chassis No. 32 as featured on the front cover of Bernard Cowdray's book "The Screamer Era". Class winner in 2 of 3 HSCC events completed in 2005. Pole and fastest lap in 3rd. Top 4 finishes in 2 European F3 Historic races. Spare set of original Brabham wheels + 12 extra gear ratios and other assorted spares. Tailor-made Brian James 4-wheel covered trailer. CH Wheels from my Chevron B17.New split rims .8" and 10".centres in the old revelution pattern. Very Beatifull and fine Tecno 1000cc, completly restored to last nut and bolt and in mint condition. Fresh engine from Urban F?ssler, complete history. Last race in 2001 by Palle Ringstr?m in the HRA German Open, before driven by Hermann Unold. FIA Historic Vehicle Identity form and the original ONS Papers. A lot of spares comes with the car.